Following the NIV Translation of the Bible, the New American Standard Commentary is an excellent semi-technical commentary on the Bible. Inside students, pastors, and teachers will find excellent research and insight from some of the best Bible scholars in the world. In this edition, Isaiah 40-66, Gary Smith provides an excellent exegetical and theological commentary on the second part of Isaiah. Providing a thorough discussion on authorship (including separate treatments on 40-66 and 55-66), Smith updates readers on current trends in scholarship as well as stating his own argument and conclusion. Students with limited or no knowledge of Hebrew will find his commentary accessible and informative. • Commentary based on the New International Version (NIV). Gary V. Smith’s second volume on Isaiah looks deeply and in wonder at the God who is both intimate and compassionate (Isaiah 40:28: “He gives strength to the weary and increases the power of the weak”) and larger than our comprehension of time and space (Isaiah 66:1: “Heaven is My throne, and the earth is My footstool”). Gary V. Smith is professor of Christian studies at Union University in Jackson, Tennessee, where he teaches Hebrew and Old Testament courses. He has also authored several previous commentaries and worked on four Bible translation teams. Smith holds degrees from Wheaton College (B.A. ), Trinity Evangelical Divinity School (M.A. ), and Dropsie College (Ph.D.). 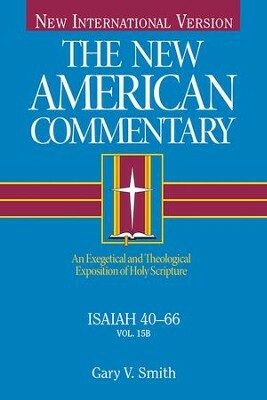 I'm the author/artist and I want to review Isaiah 40-66: New American Commentary [NAC] -eBook.